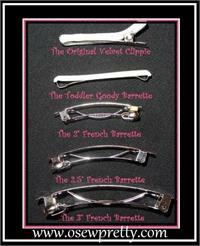 SELECT JUST THE RIGHT HARDWARE OR HEADBAND FOR YOUR O'SEW PRETTY HAIR BOW. CHOOSE FROM VELVET CLIPPIES, FRENCH STYLE BARRETTES, CROCHET HEADWRAPS AND RIBBON COVERED HEADBANDS. AVAILABLE FOR INFANTS, TODDLERS, TWEENS AND TEENS. BEAUTIFUL BOWS FOR BEAUTIFUL BOWS. PLEASE NOTE Items on this page are not for sale and are only a picture to show you the types and styles of hardware that will be used on your hair bow.